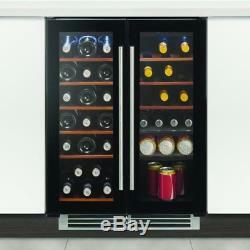 Caple wine fridge undercounter&###xA0;chiller cabinet 60cm dual zone ex display Wi6231. Caple wine fridge undercounter chiller cabinet 60cm dual zone ex display Wi6231. Been installed in show home at high end property. Never used for its purpose. Does not have bottom metal ventilation&###xA0;grill that goes into kitchen plinth. This fantastic black undercounter dual zone wine cooler from Caple has a capacity of 38 bottles and a noise level of 42 decibels. With two separate zones it means you can keep white wine and red wine at two separate temperatures. It is suitable for undercounter installation and has a recessed base so your plinth can run along the front of it. Black glass doors with gloss black door frame Toughened UV protected glass Black cabinet interior and exterior Stainless steel handles Electronic temperature control and LED display 2 independently controlled temperature zones 5 sliding shelves and 1 base shelf per zone Maximum storage capacity 38 x 750ml wine bottles (19 bottles per zone, 3 bottles per sliding shelf, 4 bottles per base shelf) Total net capacity 140 litres / 4.94 ft&###xB3; Dark wooden shelves White LED interior lighting with on/off switches Temperature range 5&###xB0;C &###x2013; 18&###xB0;C (both zones) Humidity range >65% RH 2 humidity control water tanks No frost compressor cooling system Fan circulated cool air for even temperature distribution 2 heaters raise internal temperature when external temperature drops Noise level 43dB Annual energy consumption 195 kwh Ambient temperature 16&###xB0;C &###x2013; 32&###xB0;C Dimensions: h865-885 x w595 x d583mm Suitable for 100-150mm plinth. Please note: This appliance needs a gap of 605mm to enable the doors to open fully. This wine cooler is suitable for integrated built under or freestanding undercounter fitment. It has a recessed base for fitting a furniture plinth. Air ventilation through your plinth is required for built under installation. H for all collections, if other&###xA0;methods required please advise. Collections and couriers are welcome and strongly recommended for oversized or overweight items that we are not able to use nationwide services for. &###x200B;&###x200B;&###x200B;&###x200B;&###x200B;&###x200B;&###x200B;All collection from Pinner HA5 (London), easy access from M25, not far from Heathrow. &###xA0;All items we list are held in stock but please do not hesitate to ask any questions beforehand. We can supply&###xA0;any German brand any&###xA0;bathroom products to order from current brochures/catalogues so please enquire. &###xA0;Please note that some items listed can be older stock and have dusty or tatty packaging. If packaging is important please enquire before purchasing. United Group cover&###xA0;United Builders, United Joiners, United Floors, United Windows and United Bathroom supply and fitting services within London and surrounding areas. Since we only deal online all collections and viewings are by appointment only in advance. Howerver visit slots have to be planned and adviced&###xA0;quite precise&###xA0;for all visits whatsoever. Any damaged parcels should not&###xA0;be signed for or must be marked as "unchecked" upon signing for&###xA0;and must be reported back to us. Any product you return must be in the same condition you received it and in the original packaging with all labels. Caple wine fridge undercounter chiller cabinet 60cm dual zone ex display Wi6231 Been installed in show home at high end property. Does not have bottom metal ventilation grill that goes into kitchen plinth. Black glass doors with gloss black door frame Toughened UV protected glass Black cabinet interior and exterior Stainless steel handles Electronic temperature control and LED display 2 independently controlled temperature zones 5 sliding shelves and 1 base shelf per zone Maximum storage capacity 38 x 750ml wine bottles (19 bottles per zone, 3 bottles per sliding shelf, 4 bottles per base shelf) Total net capacity 140 litres / 4.94 ft³ Dark wooden shelves White LED interior lighting with on/off switches Temperature range 5°C – 18°C (both zones) Humidity range >65% RH 2 humidity control water tanks No frost compressor cooling system Fan circulated cool air for even temperature distribution 2 heaters raise internal temperature when external temperature drops Noise level 43dB Annual energy consumption 195 kwh Ambient temperature 16°C – 32°C Dimensions: h865-885 x w595 x d583mm Suitable for 100-150mm plinth Please note: This appliance needs a gap of 605mm to enable the doors to open fully This wine cooler is suitable for integrated built under or freestanding undercounter fitment. The item "Caple wine fridge undercounter chiller cabinet 60cm dual zone ex display Wi6231" is in sale since Monday, November 12, 2018. This item is in the category "Home, Furniture & DIY\Appliances\Fridges & Freezers\Wine Cabinets/Fridges". The seller is "unitedbathrooms" and is located in Pinner.